Over the past two summers the Bonavista Peninsula has seen a surge in tourism. The town of Trinity has been popular for quite awhile with its photogenic streets and excellent theatre, but in recent years there’s been a rush in new businesses opening up and down the peninsula that’s breathing new life into the rural area. Bonavista is bucking the trend and growing, not shrinking. Young people are moving in and making it their home. There’s a healthy craftsperson and artisan community which I just love. While it’s got tons of history as the landing spot of John Cabot’s ship, The Matthew, the Bonavista peninsula can also give us a glimpse of what the future of rural Newfoundland could look like. Keep in mind that many businesses are seasonal and will only be open between May and October so it’s best to check with them directly if you’re visiting outside of those months. Will the Bonavista Peninsula be your next Newfoundland road trip? The Discovery Trail is a keyhole-shaped driving route that can be accessed either from Port Blandford or Clarenville. While it’s possible to get to Trinity and Bonavista from St. John’s daily on a shuttle, you won’t be able to fully explore the Bonavista Peninsula without your own vehicle. Shuttles run from Bonavista at 7am and from St John’s at 2pm. If you’re looking to save some money and meet new people, book your stay at the Skerwink Hostel, a member of Hostelling International. They have two dorms and also private rooms. They’re located in Trinity East near the head of the Skerwink Trail and only a 15min walk from Port Rexton Brewery. Located directly in historic Trinity, Trinity Eco-Tours Lodge has cozy, affordable rooms and an equally cozy restaurant/breakfast area. 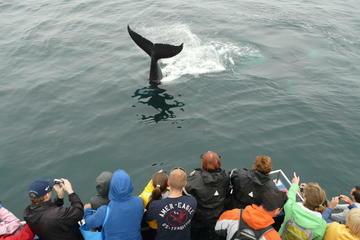 You can also book your whale and iceberg zodiac tours directly with Skipper Bob. Travelling with other couples or planning a girls weekend? The vacation homes from Artisan Inn are perfect. Traditional charm mixed with modern amenities and the perfect views, you can’t go wrong. If you’d like to stay in the town of Bonavista instead, check out the Russelltown Inn. Located over several restored heritage properties the rooms have what I call a “cabin chic” feel – rustic and upscale all in one. Your stay also comes with breakfast, which is always a bonus. If you’re looking for family accommodations or you’re travelling with friends, check out the Linthorne Loft, which has two bedrooms and three beds to accommodate a bigger group. It also has a fully equipped kitchen, but with Sweet Rock Ice Cream on the street level, I’m sure you’ll be tempted to get out and sample their wares. Ever since they opened almost two years ago, Port Rexton Brewery has gone from strength to strength. They are a destination unto themselves and the first in the new wave of Newfoundland craft breweries. 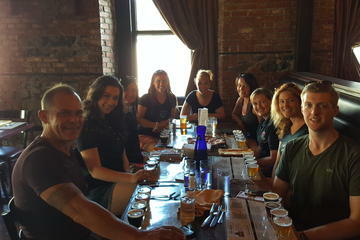 Be sure to stop by for a taste and to pick up a growler for your trip. Located near Port Rexton Brewery on the main highway, Two Whales Cafe were one of the first to offer espresso based drinks on the peninsula. They also have an array of delicious baked goods, which includes many vegan or gluten-free options. The Boreal Diner opened in the summer of 2016 and instantly became a go-to restaurant in Bonavista. They offer a small but regularly changing menu of fresh, local dishes that are sure to get your mouth watering. And all served in the cutest renovated building in the heart of Bonavista. If you like pizza, and who doesn’t, you’ll want to make the journey to the Bonavista Social Club. They have the only commercial wood-fired bread oven in the province, which makes for truly spectacular pizza. Get one with a glass of rhubarb lemonade and grab a seat outside to watch the sunset. Magical. If you’re looking for a romantic dinner for two, look no further than the Twine Loft. Enjoy a multi-course evening meal by candlelight on the water’s edge in Trinity. You may not think of upscale fine dining when you think rural Newfoundland but the Twine Loft is out to change that. Check out the newest addition to the food scene and hit up the Saucy Mouth food truck for international street fries or Asian noodle bowls. Check their Facebook page to see their specials. The Skerwink Trail is a roughly 5km hiking trail in Trinity East. It’s a moderately easy trail that goes from spectacular view to spectacular view. You’ll see seabirds, sea stacks, and great ocean vistas. Pack a lunch from Trinity Mercantile and a few cans from Port Rexton Brewery and make a day of it. Back in 1497, John Cabot discovered Newfoundland and the Grand Banks. A replica of his ship was built in 1997 to celebrate 500 years since the discovery. It was sailed across the Atlantic and you can now visit it and step on board yourself in Bonavista. It’s amazing to see how small it really was to make such a big voyage. Rising Tide Theatre is a premier theatre troupe based in Trinity. Every summer they present several different plays and dinner theatre shows. One of their most popular events is the Trinity Pageant which is held outdoors in locations around the town. No matter which show you see, you can’t go wrong. Want to get up close with some puffins? The little clowns of the sea like to hang out in two main areas on the Bonavista Peninsula: an island colony near the Bonavista Lighthouse and a second colony in nearby Elliston. It’s the latter where you’ll really get to see them up close. The history of sealing is vividly brought to life at Home from the Sea, a museum and art gallery in Elliston. It’s also the first museum of its kind in the world, focussing exclusively on the story of sealing and sealers and the part it still plays in Newfoundland culture today. Port Union boasts itself as being North America’s only union-built town. Founded in 1917 by Sir William Coaker, it’s worth a trip just to see the remaining union row houses and take a tour of the factory building and home of the Fisherman’s Advocate. Back in 2002 a mini-series was filmed in Trinity Bay. The set for Random Passage remains to this day as a tourist attraction and history lesson. Though the buildings are not historic themselves they’re very true to what outport life was like in the early 1800s. 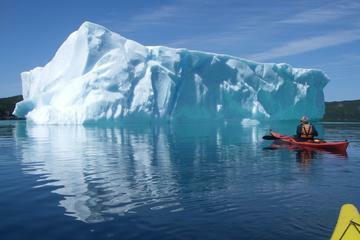 Trinity is one of the best places to see icebergs and whales in Newfoundland. I recommend booking tour with Trinity Eco-Tours. You’ll get suited up in a warm flotation suit and take a spin out in a zodiac so you can really get up close and personal with the wildlife. Ask Skipper Bob if Finnegan the humpback has been around lately. In the 1980s a theme park was developed in Trinity from the leftovers of a Newfoundland Railway loop. It had a train, ferris wheels, mini golf, cabins, and a petting zoo. The park was closed in 2004 but never dismantled. If you’re looking for some interesting photo ops and a bit of spook factor you can still visit the park, but be careful as nothing has been maintained so there could be hazards. Rural Newfoundland and contemporary art? Oh yes, you can find that here. Be sure to visit 2 Rooms Contemporary Art Projects in Duntara and learn about the material culture of Newfoundland. What better way to see the local Bonavista area than on bicycle? You get to see so much more when you’re not zipping by in a car. Bonavista Bicycle Picnics & Cafe will rent you a bike packed with a full picnic basket and local map with suggested routes. Plan to spend at least two days exploring the area, but really four would be better. There’s enough to see and do so I guarantee you won’t be bored. Oh shoot! That’s too bad. I ate there last summer and really enjoyed it. I’ll have to update this post. Thanks for letting me know. Love a Bonavista Pen trip and agree with your recommendations! Mifflin’s Tea Room is a sweet spot for a trad NL lunch in Bonavista if Neil’s Yard is indeed closed — their coffee is standard fare but they had a wide variety of teas when I visited last summer. I was also pleasantly surprised by the breakfast and selection of crafts at the cafe/gift shop for the Random Passage site; especially with it being somewhat off the main path. Seaport Inn in Port Union is definitely a great spot to stay for those planning on taking in sites from all around the peninsula. They are located right in the middle of everything, and the perfect spot to stay to minimize travel time no matter your destination for the day. All 28 rooms are newly renovated, and have a restaurant on site! Great article, but you need to be more informed about The Trinity Loop. It did not originate as a theme park in the 1980s. It started as part of the Bonavista Branch Railway built over 1909-1911, and evolved into a theme park after the Bonavista Branch railway was closed and trains ceased to operate.